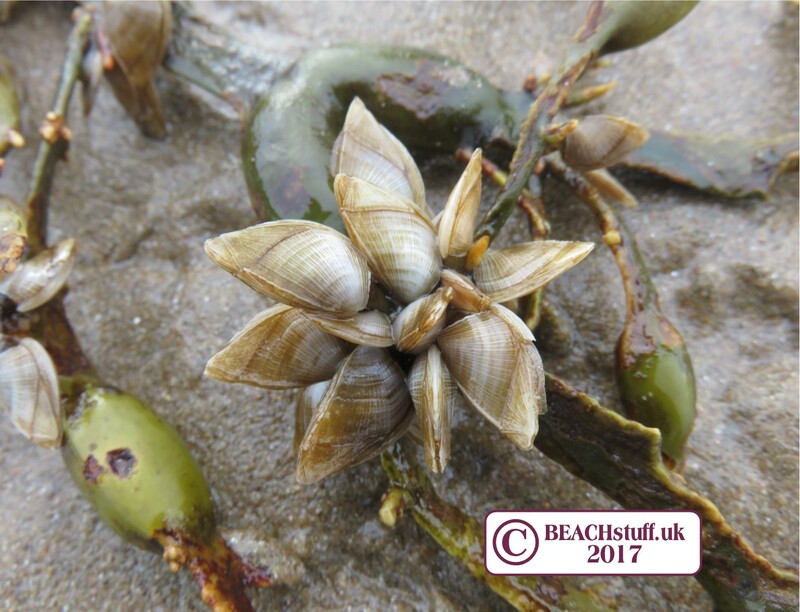 Barnacles are some of the most fascinating creatures we find on our strandlines and also some of the most frequently overlooked. 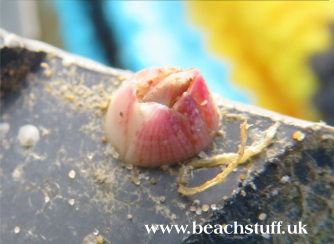 Barnacles are very closely related to crabs and shrimps, all being crustaceans. 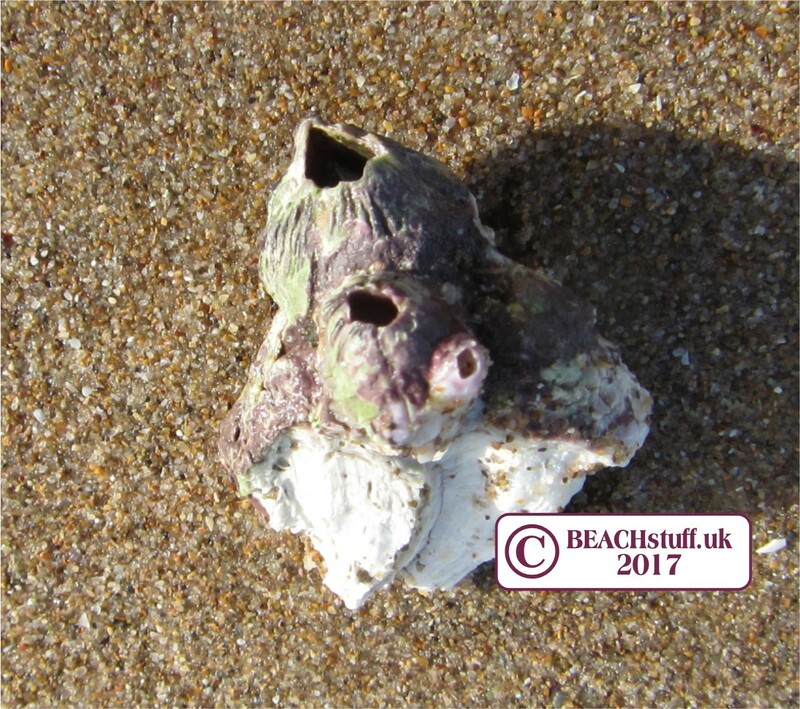 There are broadly two forms of barnacle we are likely to find washed up. The first build a tiny conical-shaped which is ordinarily attached to something solid. The second is the goose barnacle, which has protection in the form of shells made of several pieces. Ordinarily, these barnacles would be attached to rocks in the intertidal zone (between low tide and high tide) but they can become detached (in storms, for example) and then float helplessly until they are beached. They have no way of reattaching themselves and so survival is very unlikely. On the left, and in the video below, are dark acorn barnacles (sometimes called volcano barnacles) (Balanus perforatus) which are about 1-2cm tall and often purplish in colour. The barnacles on the left are another form of acorn barnacle, known as the rough barnacle (Balanus balanus), they are generally found further out to sea. 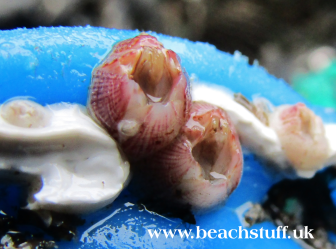 Barnacles spend their entire lives in their conical shells. They live standing on their heads and, when the tide comes in, they open their trap doors and wave their legs in the water hoping to catch bits of plankton. 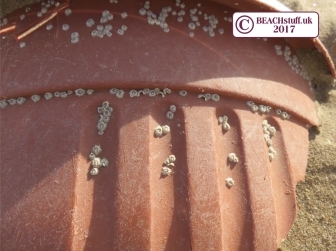 These tiny acorn barnacles (about 4mm across) have attached themselves to a plastic plant pot that was floating out at sea. Barnacles can attach themselves to most surfaces - plastic, shells, rocks, the bottom of boats as well as crabs (see the spider crab here) and even whales. These are crenate barnacles (Balanus crenatus) on a mussel shell, and often appear to be leaning. In this photo, the trap door is still present (at the top of the cone) which suggests that the barnacle may still be alive. Pop it into a bucket of sea water and, after a few hours, it may decide to stretch its legs. This one is attached to a mussel shell. 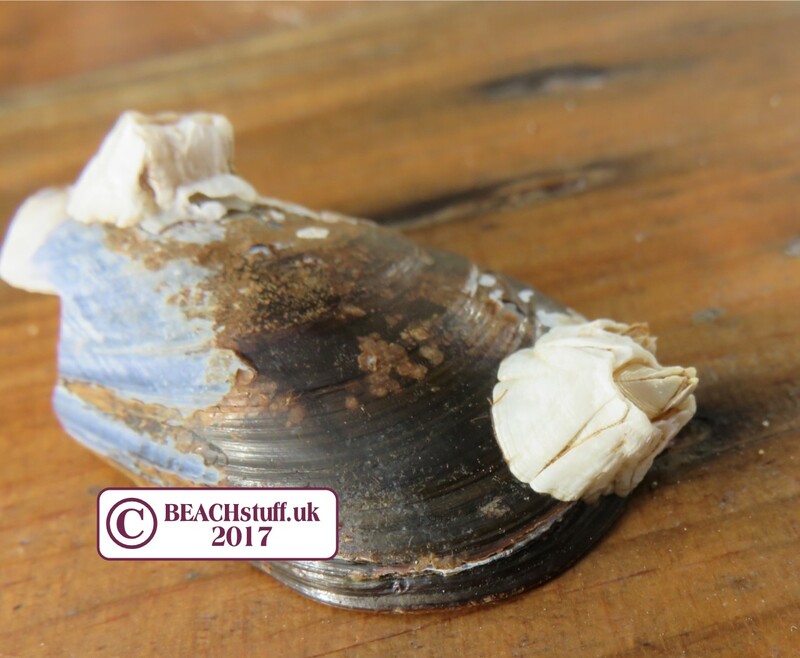 Once the mussel shell comes loose, or dies, the barnacle is at the mercy of the sea and is unlikely to survive for very long. 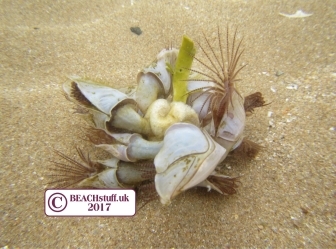 These crenate barnacles covering a whelk shell are all feeding at once - the whole shell looks like it is alive. 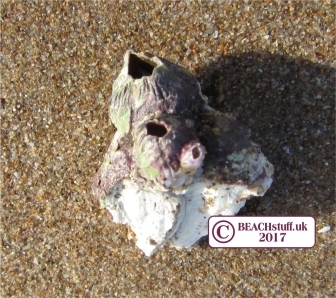 These pinkish barnacles are another species of acorn barnacle (Hesperibalanus fallax) which tend to like warmer, shallow seas. 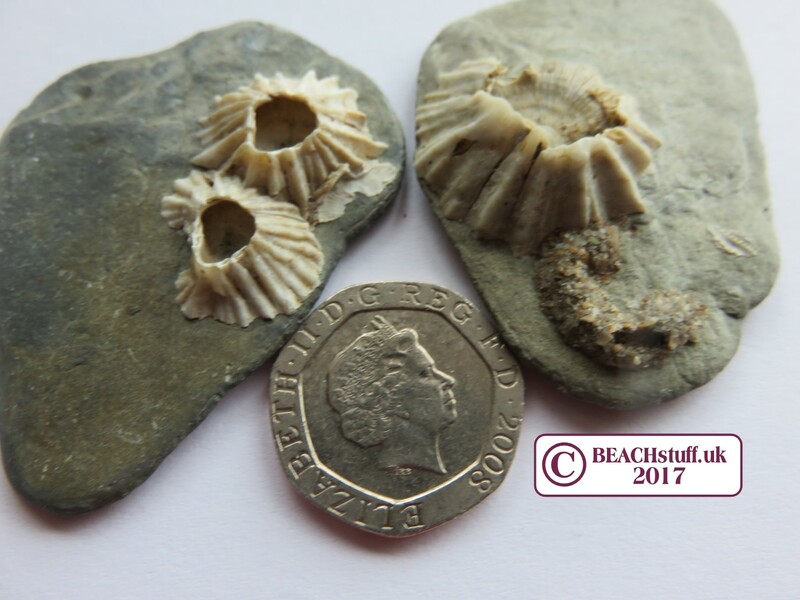 These on the right were found on lobster pots in North Devon. 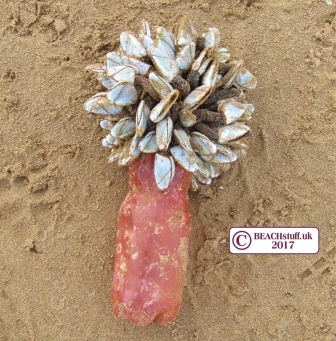 The one below was growing on a car door that was washed up on Woolacombe Beach. Goose barnacles spend their lives drifting on the surface of the ocean. They attach themselves to driftwood, boats, buoys, and bits of rubbish. Once attached, they cannot move and so travel wherever their 'host' item goes. These goose barnacles have long brown necks and white shells covering their soft bodies. When they are immersed in water, they stick their legs out in the hope of catching something to eat. At times, when washed up, they will continue to do this - see the video below. While the goose barnacles above are 3 -5 centimetres tall, these little goose barnacles are only 1-2 centimetres tall. because they are so small and light, they can attach themselves to floating pieces of seaweed but also, like their bigger cousins, attach to bits of rubbish. 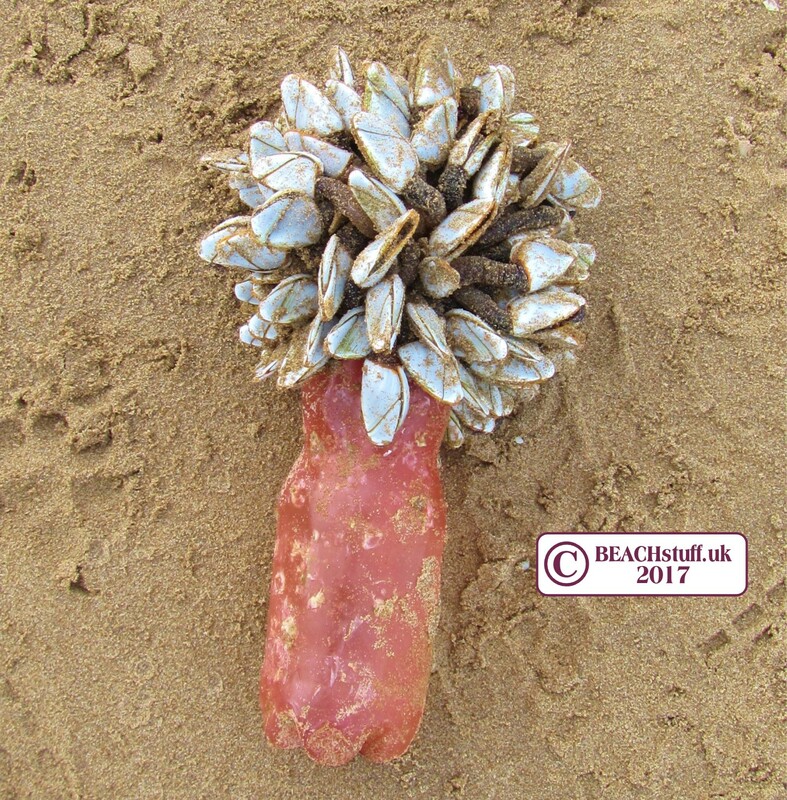 This species of barnacle, doesn't attach itself to driftwood or rubbish, but makes its own float - the white blob pictured in the middle of this cluster. This float, or buoy, keeps a number of the barnacles afloat so they can make their way around the oceans. Should you ever find goose barnacles, pop them into a bucket of sea water or a rock pool and they should immediately begin to flex their legs.